This is going to be one of many expeditions to places that are fairly lengthy. 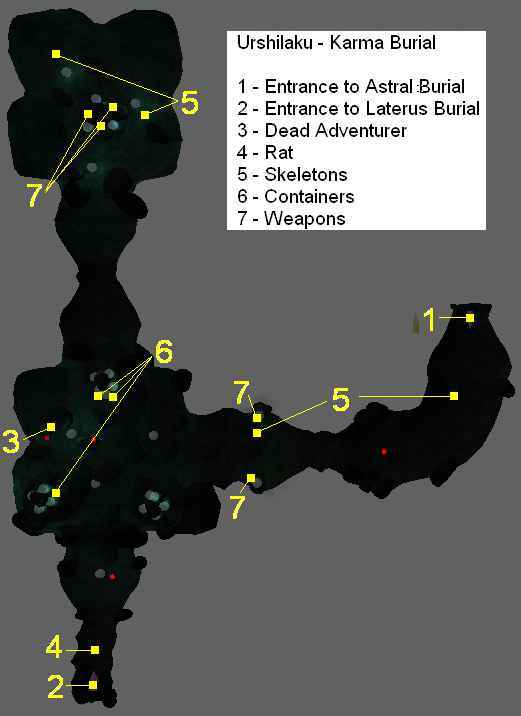 My experience with the Beginners' Guide to Daggerfall suggests that a picture is worth a thousand words, so I'll do some of these as maps rather than written directions. However, since my bandwidth is somewhat limited and graphics eat up more of it than text, I will try to keep the graphics to a minimum. Fortunately, most "dungeons" are fairly short. So written directions will suffice, the bandwidth will be preserved, the bank account won't be dinged any more than necessary, and there will be much rejoicing. 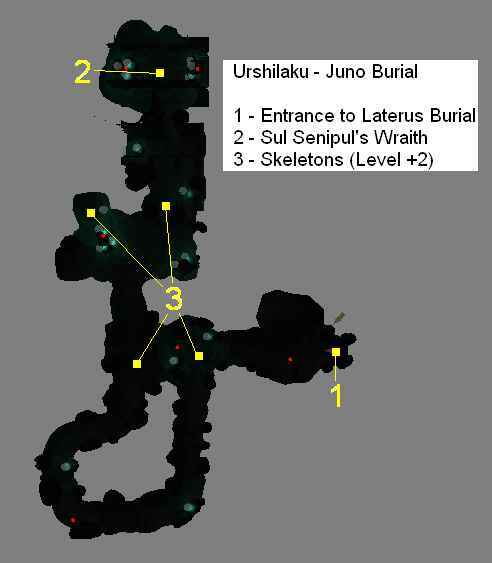 There are seven sections to the Urshilaku Burial Caverns, but you only need to go through four of them to get to your destination. This is not to say that the other three are not worth exploring, but that they are not critical to your success. 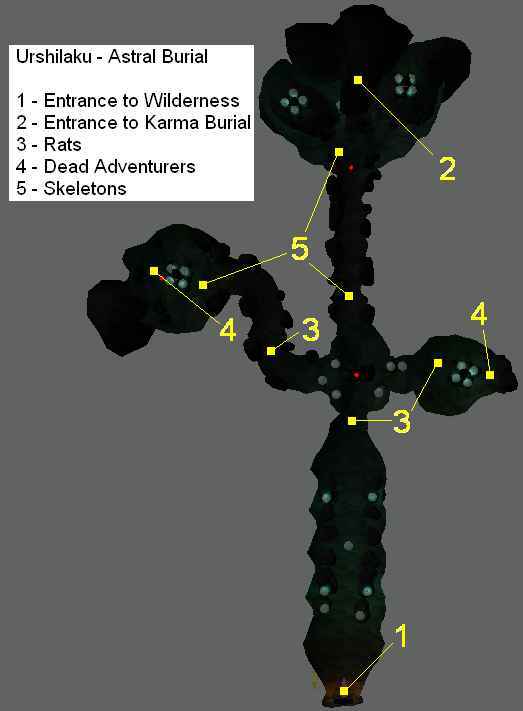 Aside from the items on your map, there are two mummies (dead, not undead) with Chitin spears near the wilderness entrance. Up near the where the two containers are next to each other, you should be able to find a couple or three Skooma potions. You'll find the bow on Sul Senipal's remains after you dispatch him. Elsewhere in this section are a few minor items: a standard Fortify Magicka potion, a quality Frost Shield potion, some Dreugh Wax, a common Soul Gem, an Apprentice's Probe, a Journeyman's Repair Hammer, an Iron Sabre and a Steel Dagger. After you have the bow, report back to Sul Martuul and he will name you Clanfriend and send you over to the Wise Woman, who will now be willing to talk about the Nerevarine. Click here to go back to that page. Accessed from Laterus Burial. A good Levitate would be very helpful in here as all of the critters are on the bottom and all of the goodies are on the top. Accessed from Laterus Burial. Fairly straightforward.